You can check out a full-size version of the True Legend poster originally on Ain't It Cool News if you wish. 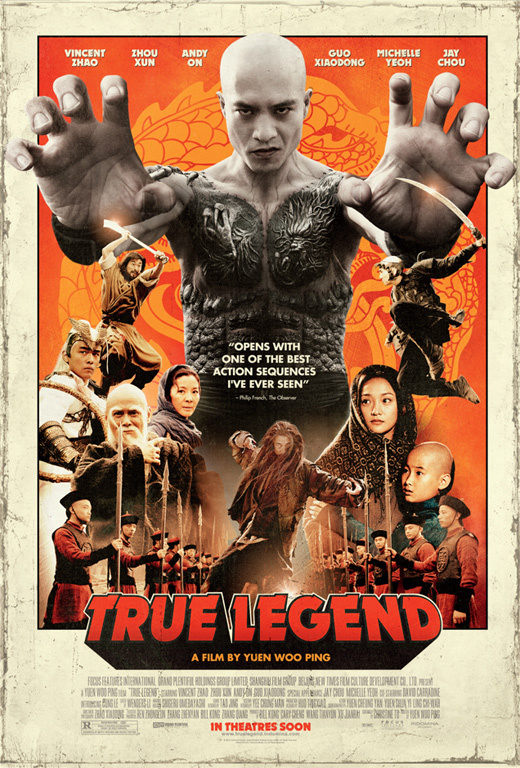 True Legend is directed by Chinese filmmaker and legendary martial arts choreographer Yuen Woo-Ping, who has directed numerous movies including Iron Monkey, Fist of the Red Dragon, and The Red Wolf. The script was written by To Chi-Long, of Blood Brothers, Jet Li's Fearless and Murderer previously. Indomina Releasing is bringing True Legend to limited theaters in the US starting May 13th. Who's going to see it? I have to see this!!!! Interesting, I might check this out. No matter how snobbish and critical I become about movies throughout my life, I will always have a warm spot in my heart for kung fu movies. And this one looks wonderful (all of the talent involved makes me giddy). Is this as good as Iron Monkey was? I loved that movie! This movie has two parts. The first part of the movie starts off with a Jet Li's Warlords movie feel. Which is sort of an old warlord fighting era. Then the film takes you into a typical Chinese master trying to open a school. This transition reminds me of a lot of films...too many to list. Then it gets crazy supernatural, like some of the kung fu movies you tend to see every now and then. By this I mean people flying 20 feet from a fart directed towards them, or some weird inanimate object that you didn't think it was possible to kill with. In any case, this first part of the movie is worth watching...makes me laugh and love the film. The second part is freakin' awesome, it is a mix between Jet Li's Fearless, Donnie Yen's IP MAN, and Jackie Chan's Drunken Master (Both of course :D). This sudden change is the best part of the movie, the "Masters" that teach him are a bit annoying, but make it understandable as to why he keeps learning. I hope I didn't spoil anything...I enjoyed it, and I know you will! WATCH IT NOW! Holyyy!!!! is that Priest Pai Mei from Kill Bill 2??? Love the stage combat in it also - Do they say where it is going to be in theaters?